Organized religion has taken on an increasingly disorganized, fractured appearance in the last few years. The faithful of many traditional denominations have been divided into warring camps. 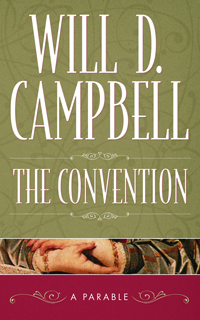 In The Convention, Will Campbell addresses the issues in the form of a parable, the oldest known form of story-telling. In Campbell’s parable, Dorcas Rose McBride emerges as a candidate for the presidency of the Federal Baptist Church at an upcoming convention. Her strongest qualification is an exemplary life of decency. She carries scripture, not in a briefcase or on cassette, but in her heart. Speeches to the convention by this Mississippi woman are filled with simple truths: allusions to gardening, country politics in the South, parenting, and how Palmolive used to smell before they changed the formula. Only Dorcas knows what the Federal Baptist presidency means to the true church. She has an inspired plan for the presidential gavel that no woman has ever wielded. And Will Campbell unfolds her plan with vision and humor,evoking more than a few tears along the way. Whatever your religious persuasion, whatever our thoughts on God and on humankind, this story will intrigue you, inform you, and inspire you.